This tremendous box was probably close to the best to appear during the Revolution. It carried 30 rounds in its pine block. 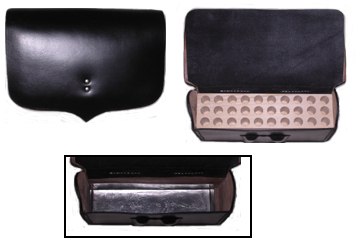 An inner flap of soft, thin leather is fitted to the flap and the whole fitted snugly over the two rounded gores at the ends, thus giving the ammunition a high degree of protection from weather. Over this was the heavy saddle leather flap held down by a brass or iron catch which hooked into a rectangular slot underneath the front edge of the box. Sewn on the front of the box under the outer flap was a thin leather pocket which held a musket tool, tow for cleaning and spare flints. 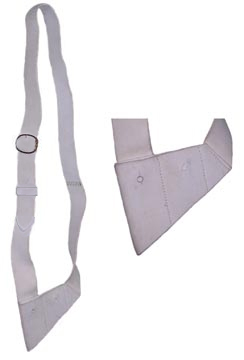 The white latigo strap is 2 5/8" wide and has wax-cast flat brass buckles with double tongues of steel. 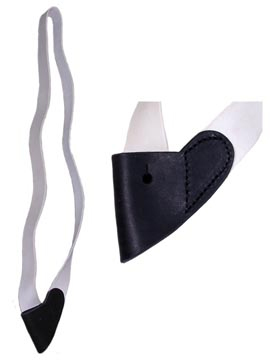 The strap is included.